You can spend as long as you like tweaking, kerning and proofing your design in the relative safety of the computer screen, but there still remains a huge sense of trepidation and anticipation when unwrapping a freshly delivered parcel hot off the press. With the invitations above the printers did themselves proud. 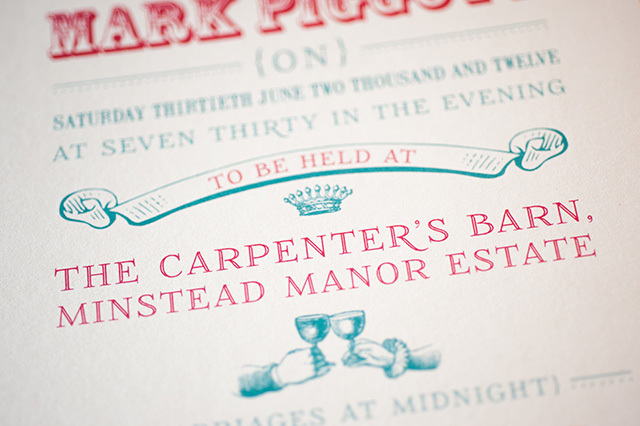 Sara & Mark wanted something type-led and vintage-inspired, with the final design drawing heavily on poster styles of the late 19th-century, complete with wood-cut influenced illustrations. 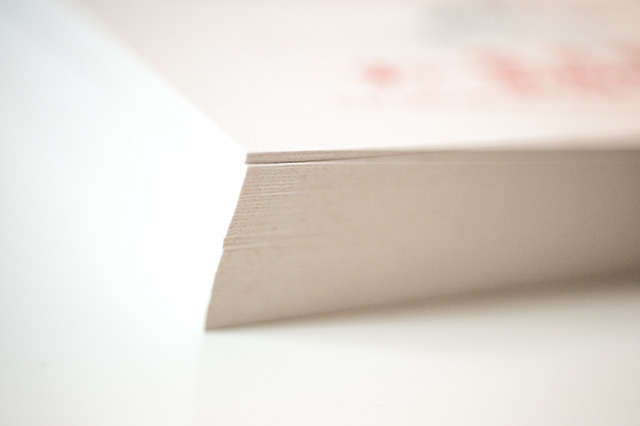 To complete the look we agreed on Colorplan’s Mist stock, with an off-white tone and tactile finish. The final product is better than we could have hoped for – colours are vibrant and punchy (even on this darker paper), and the details are crisp and precise. Take a look at the photos below and see what you think! 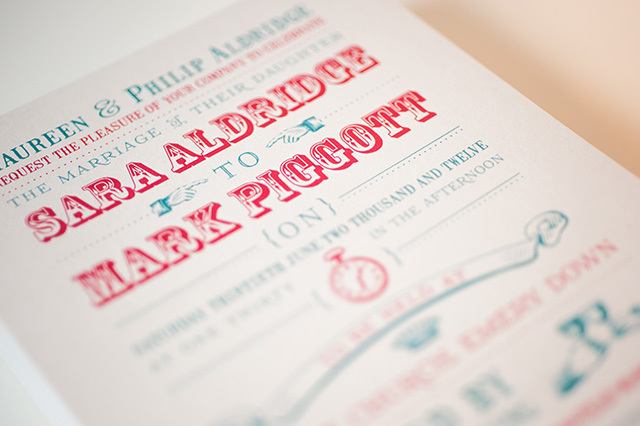 These invites are fantastic – to be framed and hung in pride of place after the wedding as a lovely reminder. Thanks Ian for capturing Sara & Mark’s ideas! Hey there! I came across your site via Pinterest (GIANT surprise, I know) and I absolutely LOVE the aesthetic of these wedding invitations and your blog in general. We live in Nashville, TN and are getting married on Sept 20th of this year at a recently renovated hosiery factory called Houston Station. We have been together for 9 years and super formal isn’t our bag so we are really throwing a great big ceremony/party for all our friends/family. I would love to talk to you more and see what ideas you could throw out and also what your fee for design would be. I included my Pinterest wedding board link for some sort of reference to the ‘feel’ of the wedding. 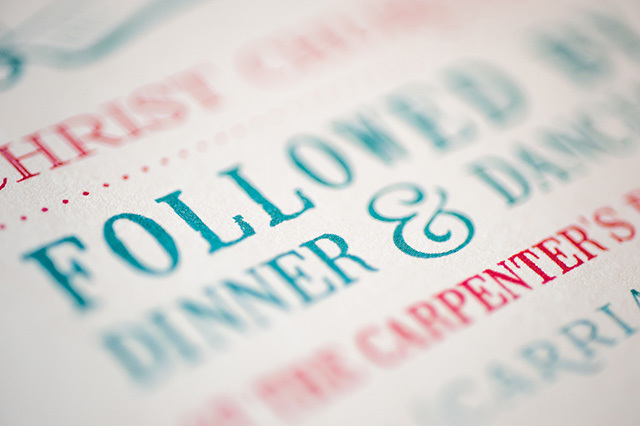 We love that Hatch Show Print letterpress style but Hatch has cutback on the wedding invites they will make.